inpursuitofrealfood | Just another coffee lover obsessed with food. Just another coffee lover obsessed with food. You can’t fail at bread making as long as you pay attention to the dough and don’t try to bake it when it isn’t ready. I thought I’d use my favorite pizza recipe (which I have posted before) and alter it to make it more heartier and with whole wheat flour. I had some millet and wheat berries I had purchased in my cabinet months ago that I never got around to using. Today was the day! These pizzas came out so fantastic! I won’t post the recipe because these have gone down in recipe history with exclamation marks beside them:) You can see from the photos what I put on the pizza anyways. As I’ve said before, you don’t really need recipes to make great food. 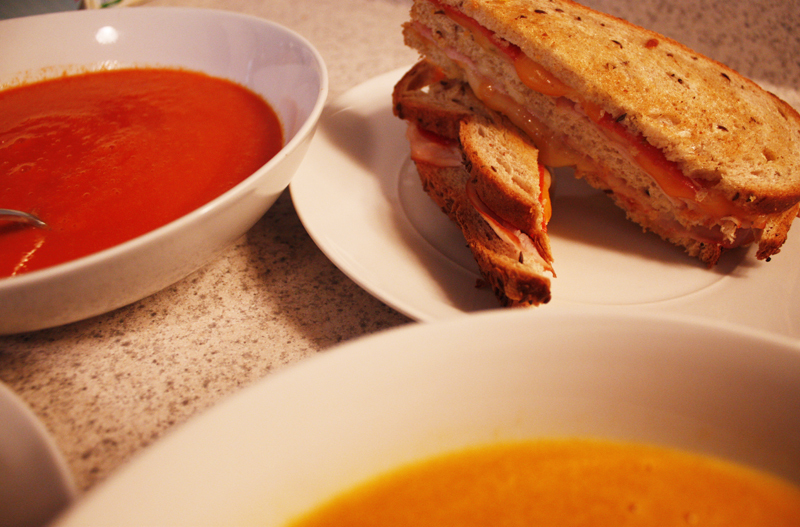 This was just another “throw together” from leftovers and things I had sitting in the fridge waiting to be used. So, yes, a hearty whole grain bread was used in these pizzas. It probably takes 15 minutes to arrive at your ball of dough ready for rising. I let it rise on the warm oven for a little over and hour and then began assembling. I can’t have tomatoes, but my husband can, so I made two different pizzas. I began with putting a thick layer of cheese down first, then a thin layer of sauce, plus some basil pesto. 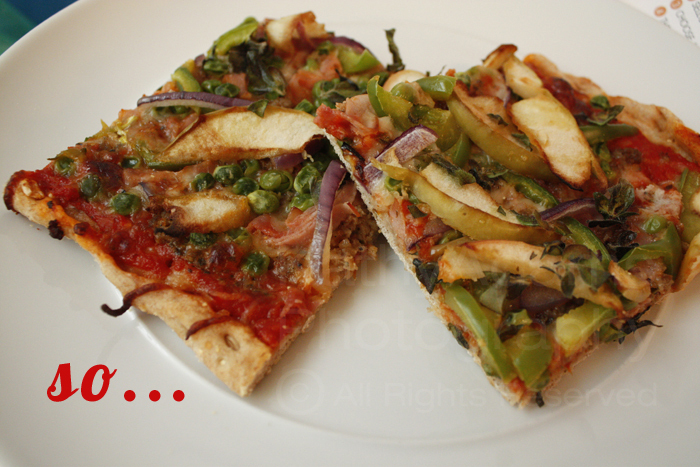 Then, I layered my ingredients I wanted on top of my pizza which did include leftover apple slices and peas! Next, I went out to my little herb garden (which, I might add I have done NOTHING to since spring hit. They all just started growing back with exception to the basil) and cut some big springs of fresh oregano. Yum! Everything went on top of the pizzas and they baked on 400 degrees for 10 minutes. Enjoy! I know I did. Highly fragrant, sweet and pungent, ginger adds plenty of flavor and spice to any dish! 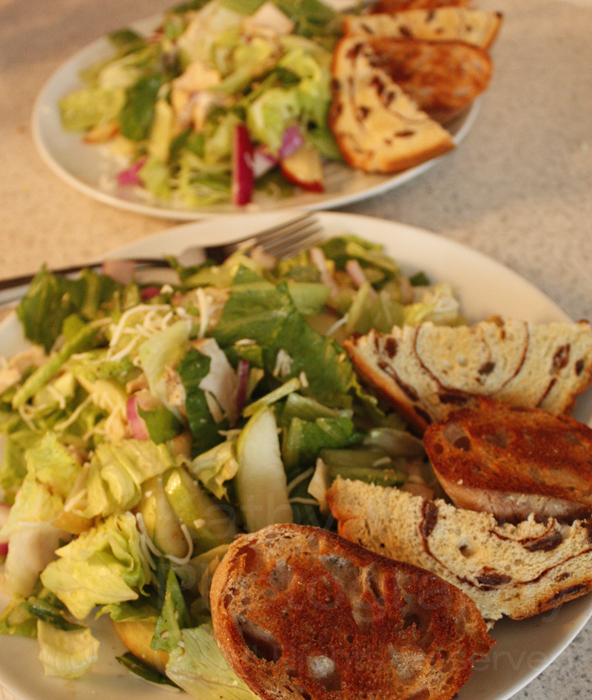 Yesterday was salad left-overs! I had some fresh ginger leftover from some sugar-free cookies I had baked, so yes, I decided it would go into a salad! A bottle of toasted sesame oil in the back of my cupboard also beckoned to become part of lunch. I don’t like using store bought dressings because: they are really bad for you, most of them are disgusting and lets be honest- they are generic. Fresh dressings taste better and are better for you! (Of course the occassional Ranch dressing has to be drizzled on things…) But, for the most part fresh is better and lacking the hundreds of bad calories also. I am partial to vinegars and oils and spicing them up with various flavors. Usually I squeeze lemon juice and balsamic and toss salt and pepper. However, today was toasted sesame seed oil, sesame seeds, some drops of balsamic and about 1 teaspoon+ grated fresh ginger for the dressing! Enjoy! Thought I would share some more of my favorite running snacks. Usually I have just one banana like that, not two. 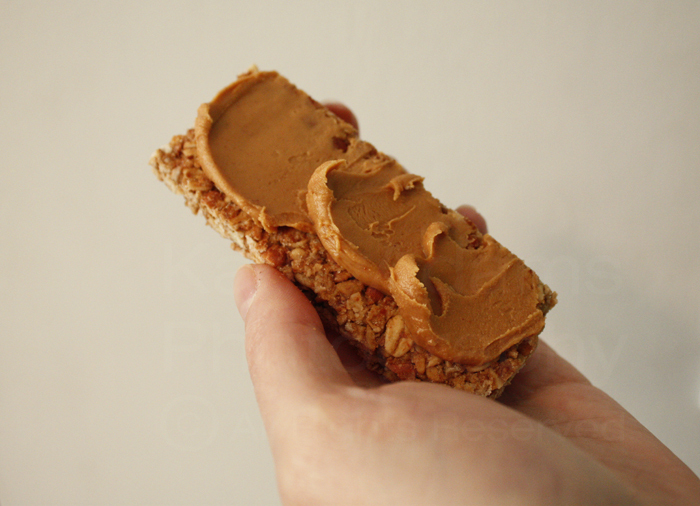 That was a little too much:) The other one is just my favorite peanut butter(Smart Balance) on a Kashi Almond bar! Yum. These are just enough to carry you through about an hour of running. I was running with my husband pretty regularly, at least 4+ miles 3-4 times a week. And then, he was in a little mishap with his motorcycle. So, he hasn’t been doing much lately but sitting on the sofa recovering:( Yesterday was a quick 3 miler for me, I left too late in the day and it was actually too hot! However, I did get one in for the day! Warmer weather is finally here! Hopefully it is here to stay! Yesterday the temp in the house was 80 degrees and we grilled and dedicated the day to yard work, which was so great. We also made it to a baseball game with friends, this weekend was a really good one that felt like it lasted a week! I also got in two short runs with my husband at the park. 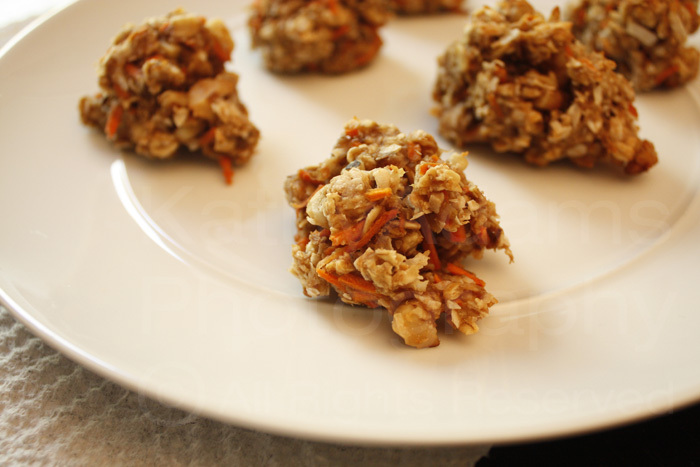 Carrot Walnut Coconut Treats! Yum! No sugar, eggs, flour or dairy! 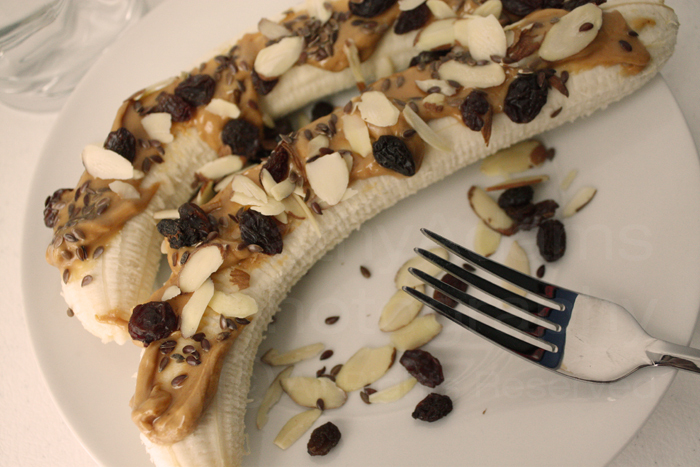 Almond, Raisin, Peanut Butter & Flax Combo! No sugar, eggs, dairy or flour! That’s right. 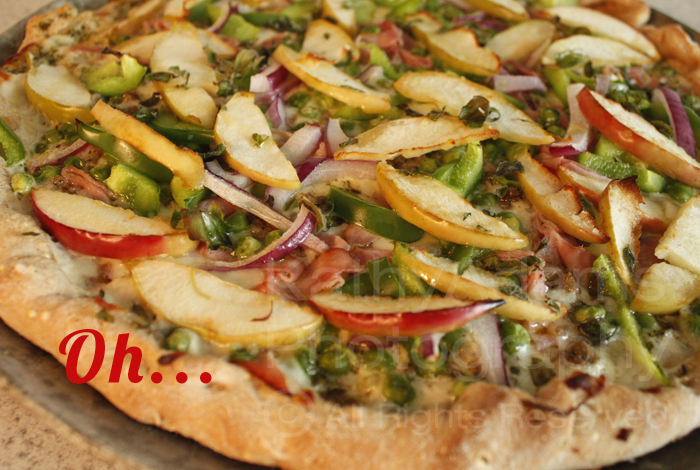 It might sound scary and like a strange experiment, but this pizza is somewhat addicting. I have made pizza before with these, but I didn’t want to heat the house up roasting them since the temps here have been in the 80s. 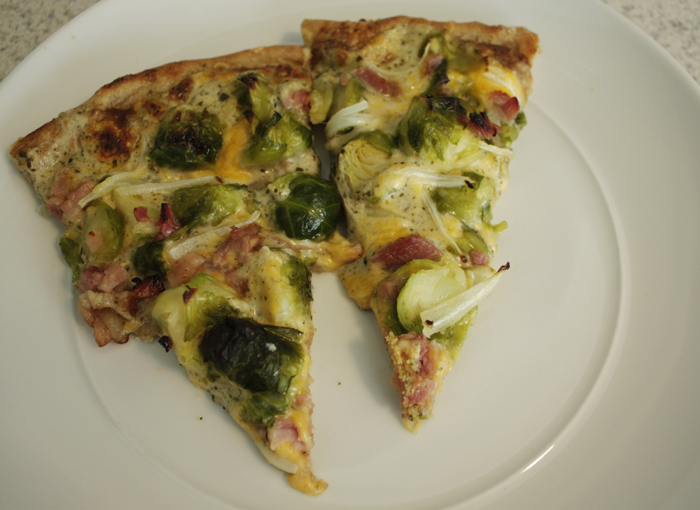 So, I cheated and bought frozen brussel sprouts, cooked them and then baked them on a pizza. So GOOD! Really, you have to try it. They satisfy your veggie craving and have the texture and fill like carbs do(like the pizza dough), sort of like potatoes. 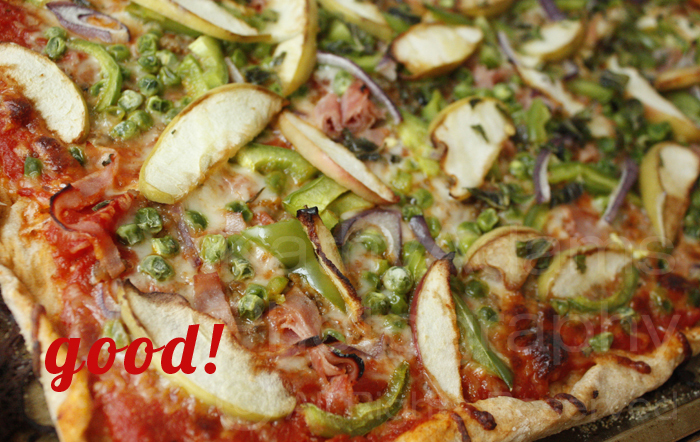 I love brussel sprouts and I love pizza, so one day I decided to put them on a pizza, it’s become a new favorite. 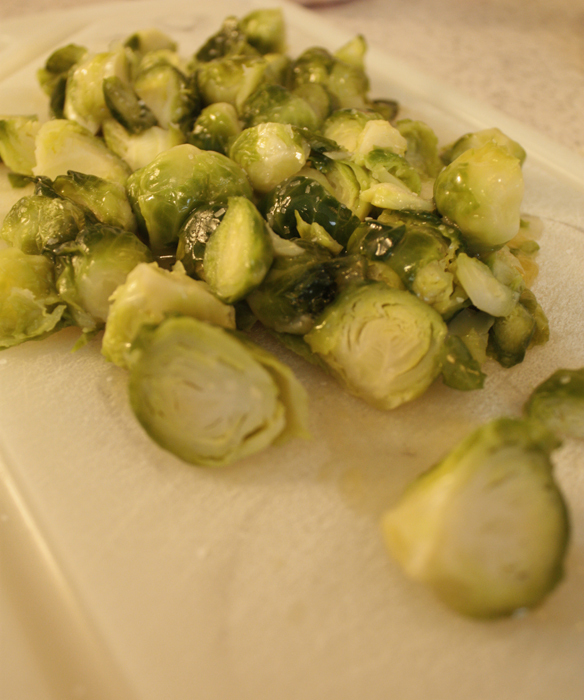 Why are brussel sprouts so nutritious? Also, today was another gorgeous day I could not miss! Today was another 5.5 mile run day at the park. Today was much easier since I’m back into running and I think my body is somewhat used to things blooming and pollen. It’s still a little difficult to breathe, but not so much as to miss out on a run in the sunshine. Again, it took only 45 minutes. It felt great, I hope you’re getting out to excercise in nice weather!! 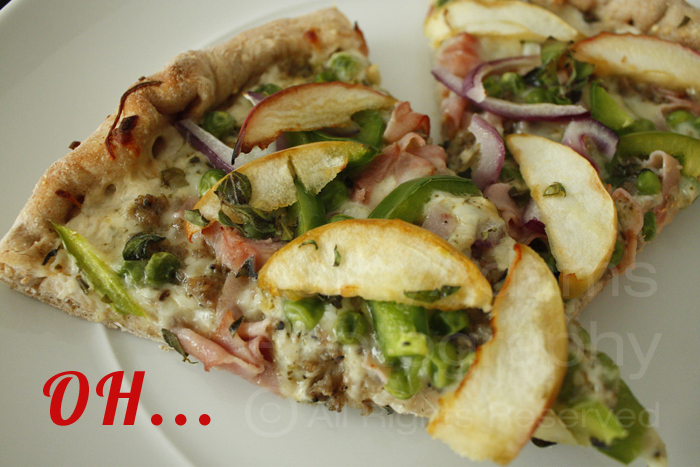 Multi grain pizza bread, a thin layer of alfredo with basil pesto, brussel sprouts, ham, onions, EVOO and cheese! 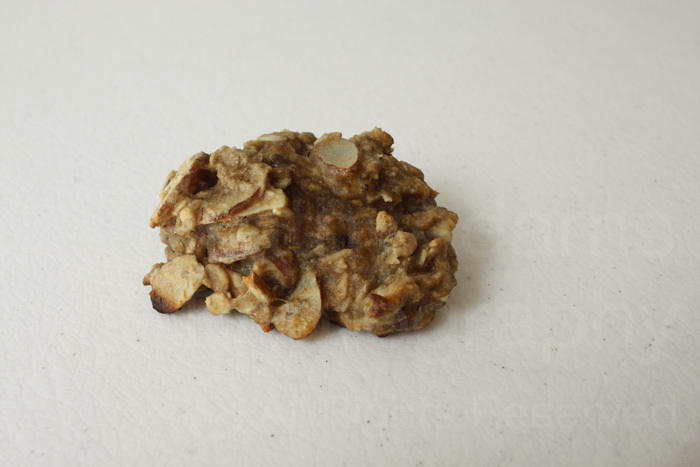 If you already eat healthy and exercise regularly, these treats are you. Before I go for a run I always hydrate and have a snack, such as a Kashi bar or several spoons of my favorite peanut butter. 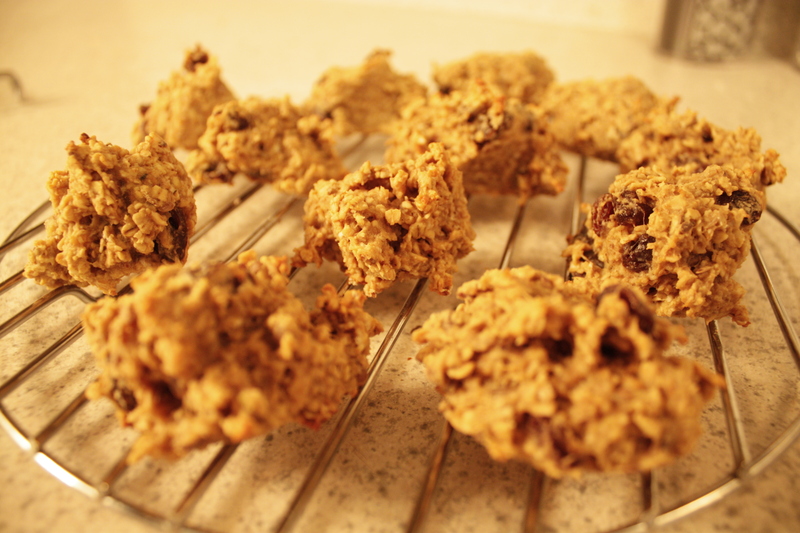 These treats are pretty awesome, I am still perfecting the recipe, however, I will share the ingredients. I’ve made these several times already and they are fast becoming a new favorite. The most important part about these tasty treats is they contain no sugar. And, I must say they are strangely addicting. As I’ve said before, if my husband will eat them and go back for a second or third, they are successful, especially with no sugar. 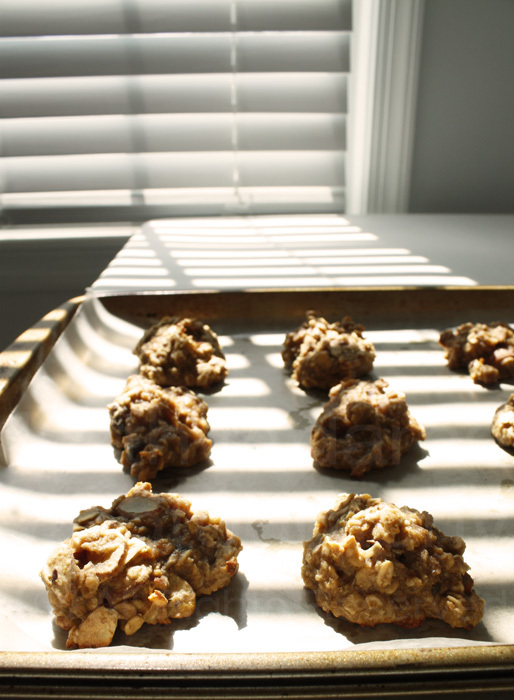 The first time I made them with agave nectar, this time, no sugar/sweetener at all, and they don’t need it. I wanted to put together some of my favorite ingredients for a little snack and so far these are it. 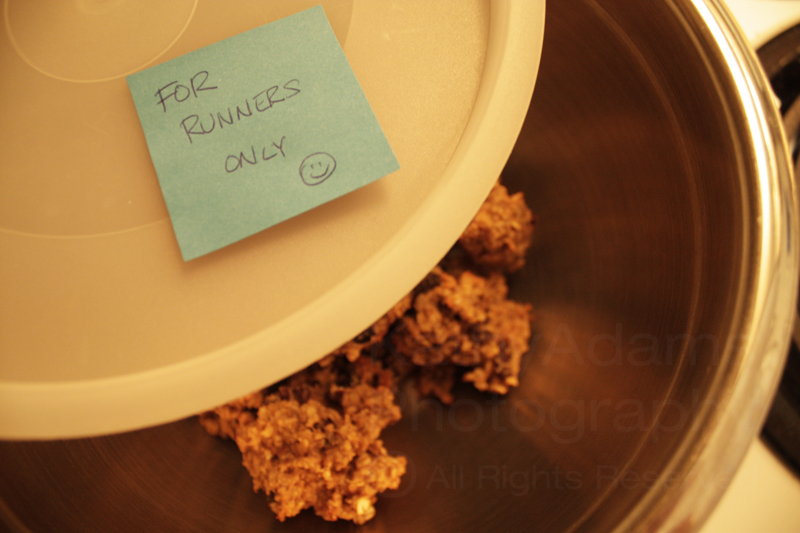 They are perfect between meals when you are straving and need a wholesome snack or right before a run! (so far, just ingredients, no recipe)As I have said before, you can easily come up with your own recipes for anything with a little experimenting and an appetite! I’m baaack, after a very long break. It seems a mix of thanksgiving, christmas, new years and a vacation in Mexico was just too much for me. Also, my dog had to have knee surgery, so caring for him has been full-time. But, I didn’t stray from exercise or eating great. Once cold weather came I became fast friends again with the gyms treadmill with my hubby still averaging around 4 miles 3 times a week with random cardio and weights. The past month a half I’ve had an eye problem which remains a mystery and has kept me exhausted with a lot of time spent in the bed sleeping and racking up doctor bills. Mexico was a great break, I ate like the world was ending and drank way too much tequila, and was entertained at the fact when I got back the scale told me I only gained a pound and half on vacation. It was good eats though, every morning I gorged on huge piles of eggs(that were insanely good) with hash browns(too good to pass up) and plates and plates of fruit with the occasional french toast. Even though there were grand buffets at dinner filled with meats, I don’t eat meats, so a little chicken, fish and shrimp was had with mostly beans and rice dishes with tons of veggies. Even though we drank bottled water the entire time were there, I gotta say I felt awful the first week back in the states. Nothing was working right and I did a lot of sleeping. Many of us did and also some kind of flu virus was brought back and spread around. As I type this now I have the flu with a 101 fever. But, my appetite is back, I just wish I could get rid of the coughing. So what else has the new year brought? Warm weather! Really strange, I’m not complaining, but it is very strange. Makes me wonder how the summer will fare. Also, my hubby and I were introduced to hashing. Every heard of it?? Google it. All I will say is, it was a dark cold night filled with beer, running, climbing, hiking, squatting, running next to the interstate(illegal?! ), crawling under an entire interstate twice through a tunnel, running through a mall getting strange stares, getting stuck on an elevator with 23 people inside, more beer, more running, scratched up legs, mud on pants, more beer and singing mixed with shenanigans all totaling 7 miles of exercise. Did that make any sense at all? Just google it. 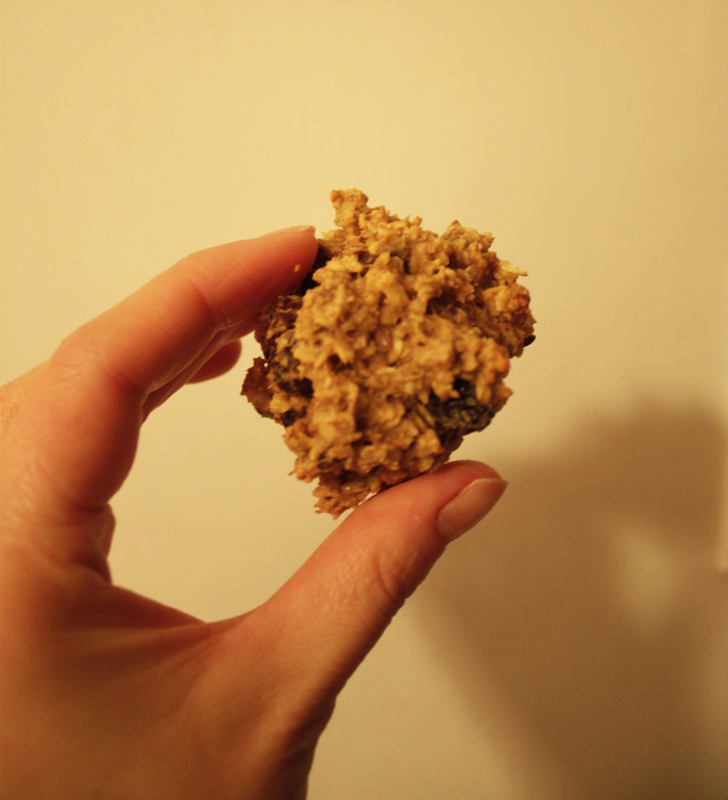 Later I need to post this sugar-free recipe I made for this cookies/bar things. 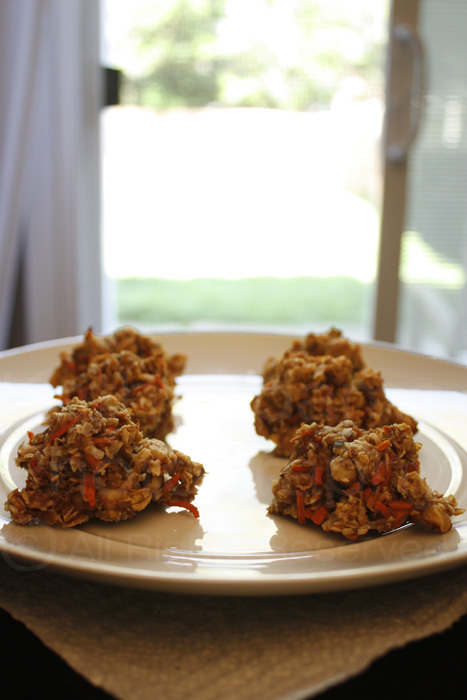 After I made them I realized they are perfect to eat before workouts. 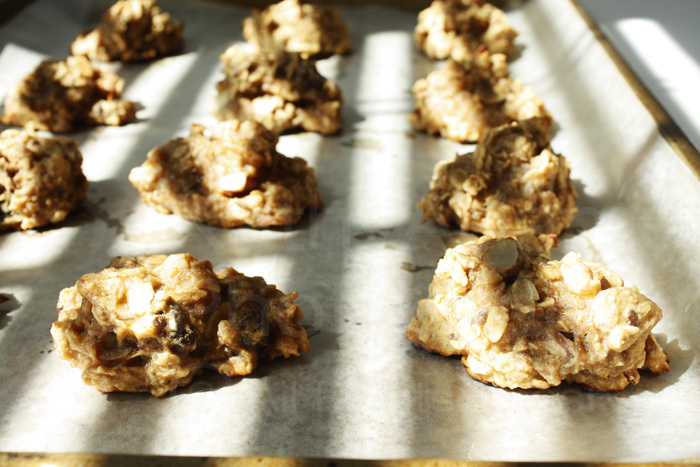 They are made with soymilk, oats, peanut butter, bananas and more good things. And Chris gorged on them, so that tells me they are really good. 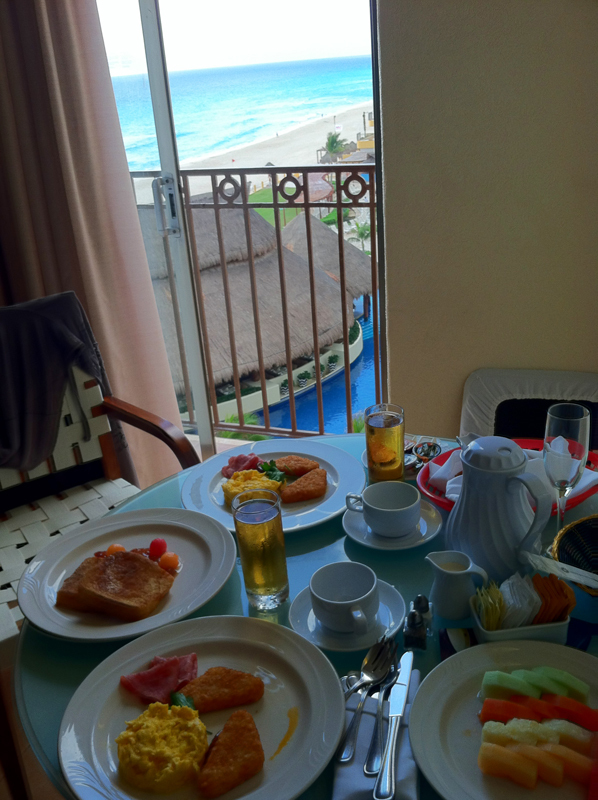 For now, I will share one breakfast photo from our vacation in Mexico. Enjoy! 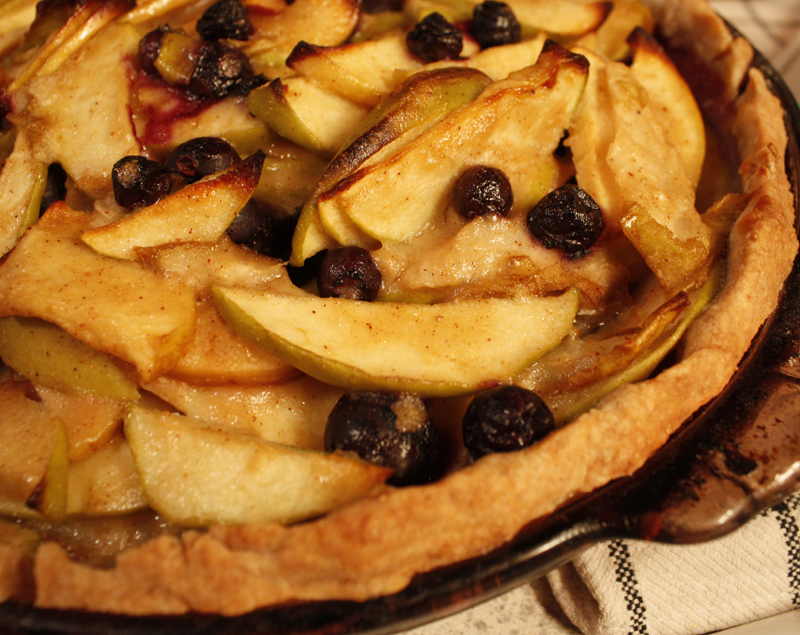 This season brings cravings for pie! I had a lot of fruit leftover from my juice fast(that was cut short)- so what else would you do with about 12 apples and pears?! A pie! Yes, and I also had some blueberries I had purchased for oatmeal in the mornings, I thought that would really bring even more interest to the taste of this pie. I found this in EatingWell Magazine, it tastes great, has some crunch and I noticed no difference at all to a regular butter filled pie crust which usually leaves you feeling full and kind of icky afterwards. 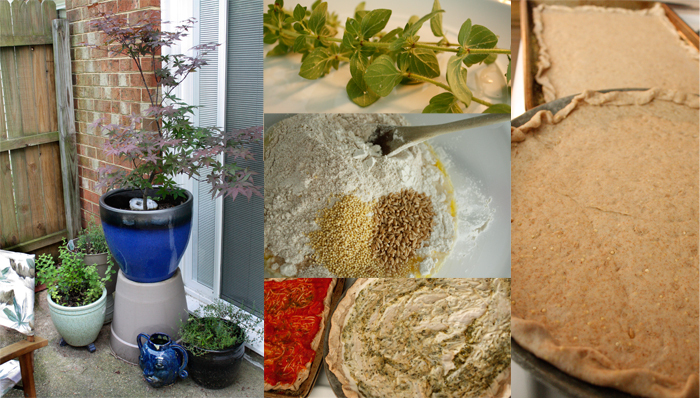 About 14 ounces dough, enough for one 9- to 11-inch pie or tart. (**personal note: I just throw it all in a food processor-done in 30 seconds).Whisk whole-wheat flour, all-purpose flour, sugar and salt in a medium bowl. 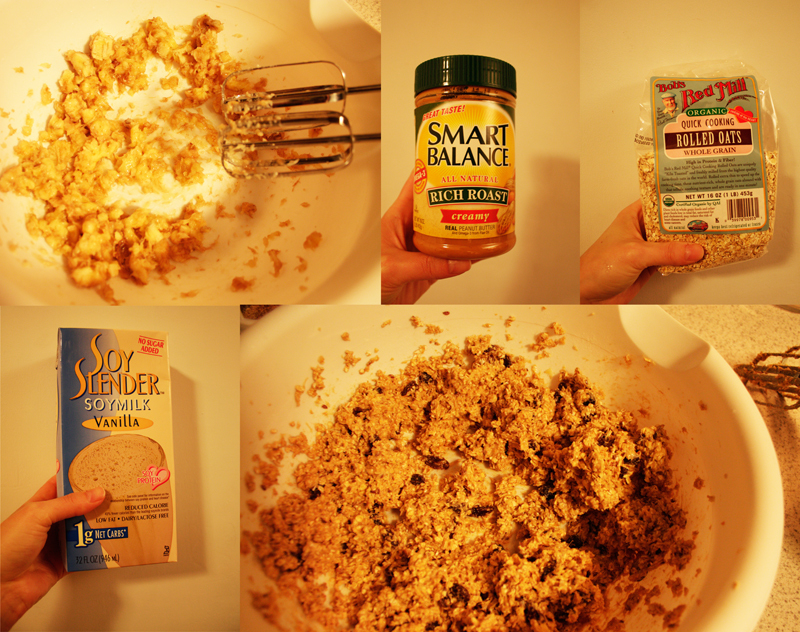 Cut in butter with a pastry blender or your fingers until the mixture resembles coarse crumbs with a few larger pieces. Add oil and stir with a fork to blend. 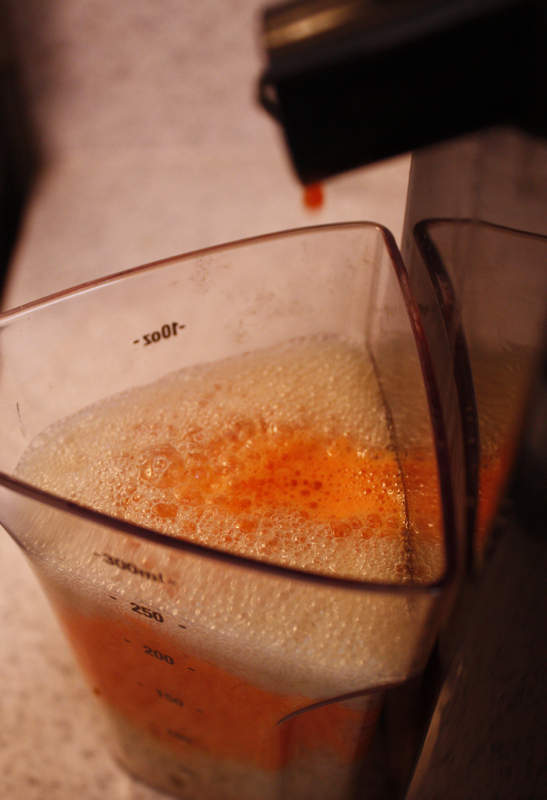 Mix 1/4 cup water, egg yolk and lemon juice (or vinegar) in a measuring cup. Make a well in the center of the flour mixture. Add enough of the egg yolk mixture, stirring with a fork, until the dough clumps together. (Add a little water if the dough seems too dry.) Turn the dough out onto a lightly floured surface and knead several times. Form the dough into a ball, then flatten into a disk. Wrap in plastic wrap and refrigerate for at least 1 hour. 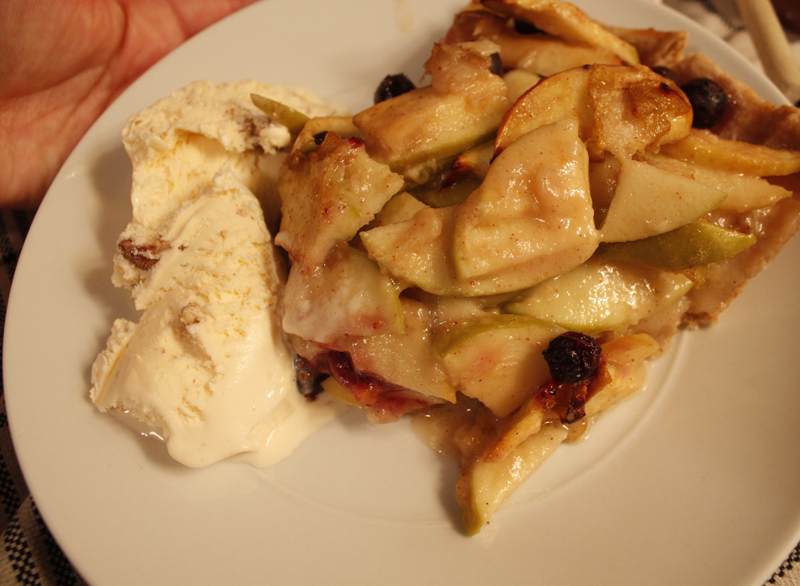 As far as the pie, I thought I would go healthier also, I really don’t like things that are way too sweet! There is no need for all that sugar. After all-this is fruit! 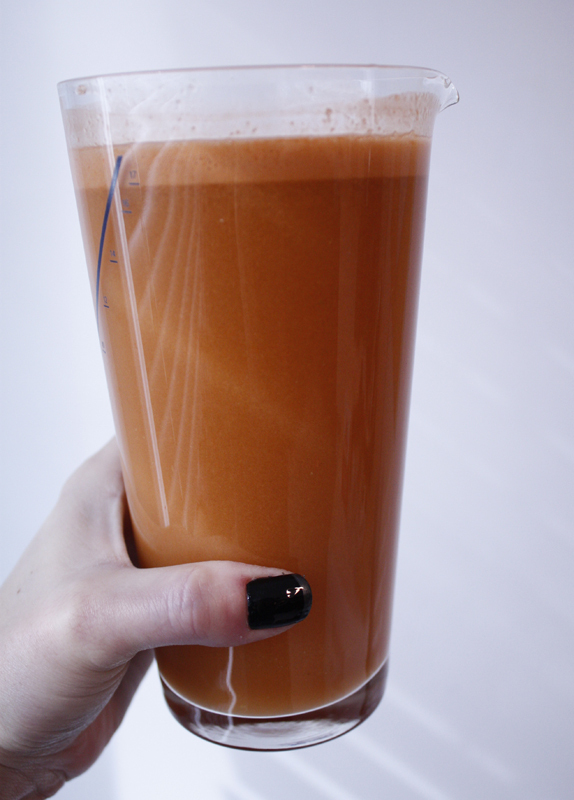 It’s already naturally sweetened, you will also learn just how much if you do a juice fast. 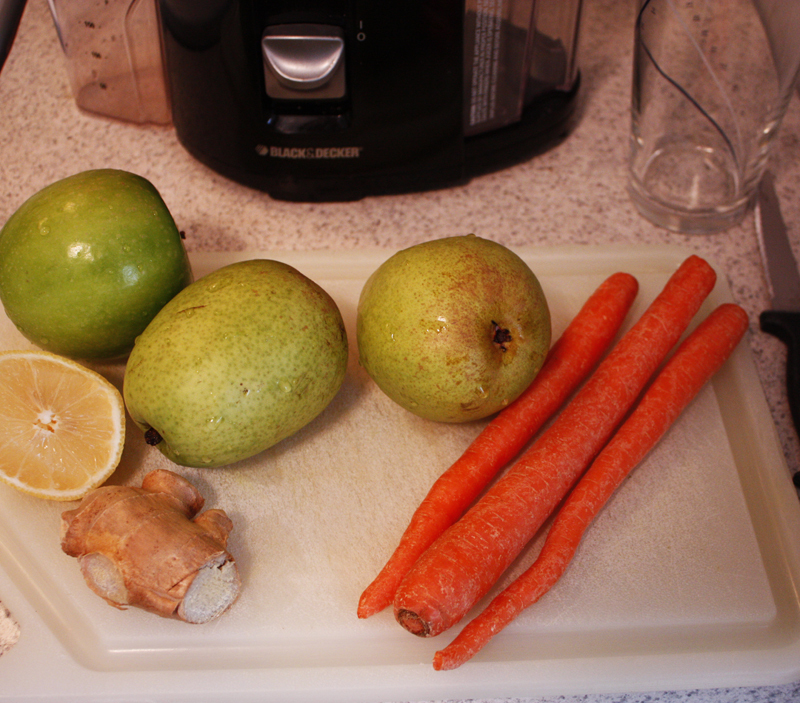 Just juicing an apple and pear will make your face quench just from how sweet and sugary it tastes. 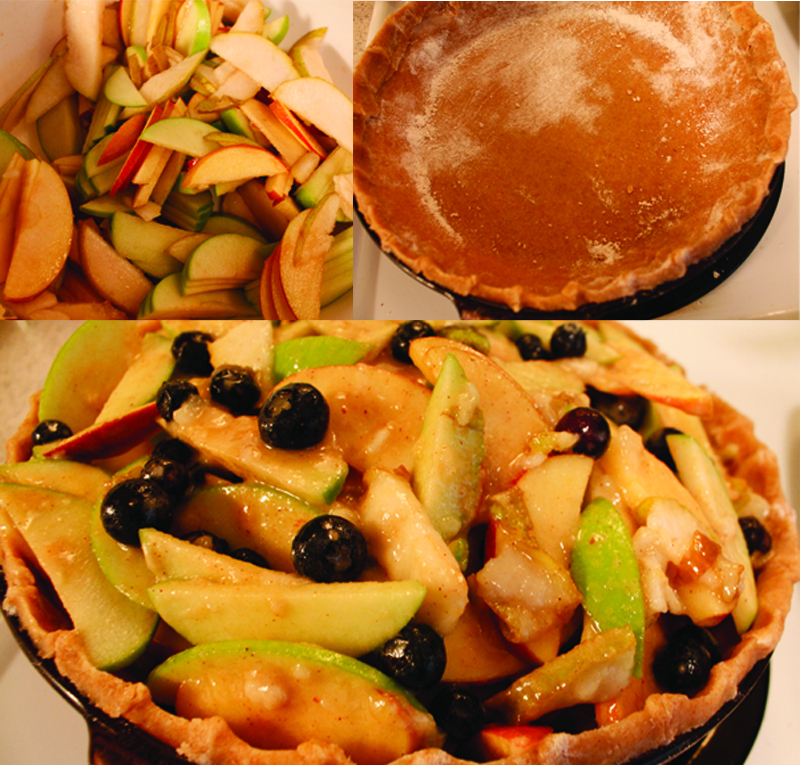 1- Slice up apples and pears very thinly (they will cook faster and be soft), pour in blueberries into a large bowl. Next, pour over juice of 1 lemon and mix throughly with a rubber scraper. 2- Add in spices, sugar, salt and vanilla. Melt butter in microwave and pour over mixture. Beat egg and pour in. Measure 1/4 flour (mixture of white and wheat flour) and pour in, stir again with a rubber scraper until all is incorporated. 3- Take out chilled pastry from the refrigerator. Roll out and form a crust in a pie pan. Next pour entire pie mixture into pie bowl. Spread out evenly. Bake immediately at 425 degrees for approximately 30-45 minutes. Watch the top, because fruit will carmelize and begin to darken. If this happens, loosely cover pie with a piece of foil until it is done. We are in the month of December I know. Even though it’s been in the 70’s every 3 days or so, which really doesn’t make it feel like winter. 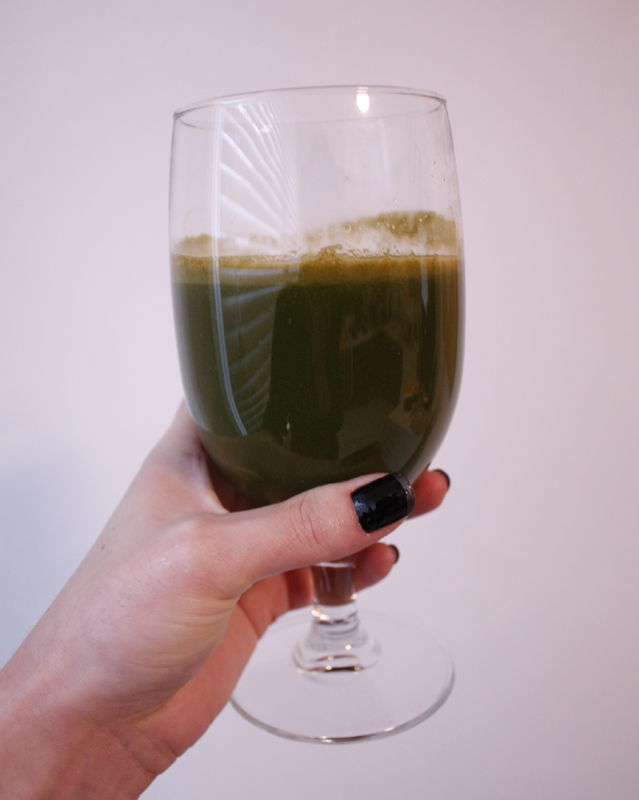 In addition, I had many things left from the ingredients I had purchased for my juice fast, one being pears and a huge amount of greens. 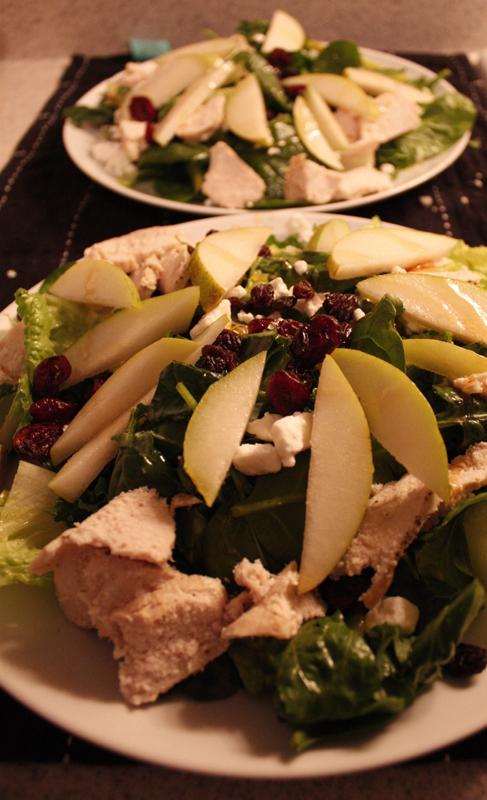 So, yes, I threw together a sweet salad in December, it was scrumptious! 1- Cut up greens in bite size pieces and put into a bowl. Drizzle in 1 T or more (if you like balsamic) and also squeeze the juice of 1/2 lemon and a good amount of orange juice(maybe several Tablespoons)! Throw in some Kosher salt and pepper and mix together well with a rubber spatula. 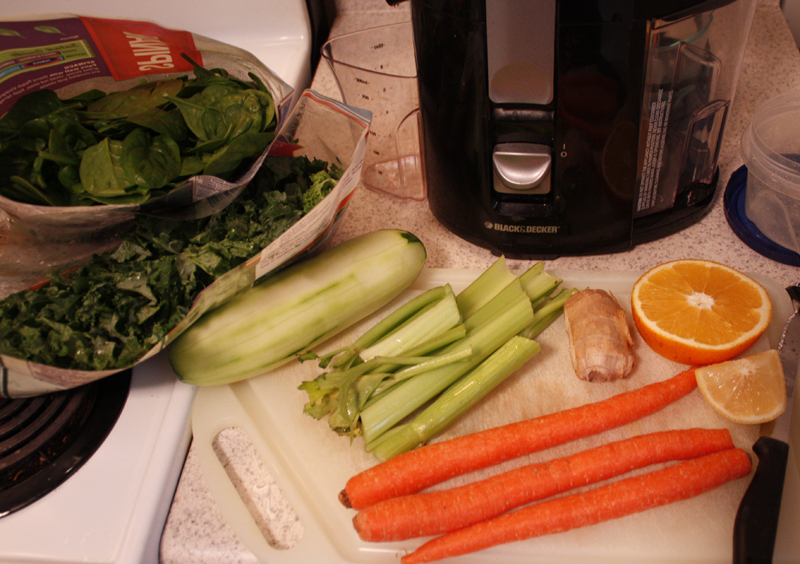 2- Pour seasoned/juiced greens onto a plate and spread them out. 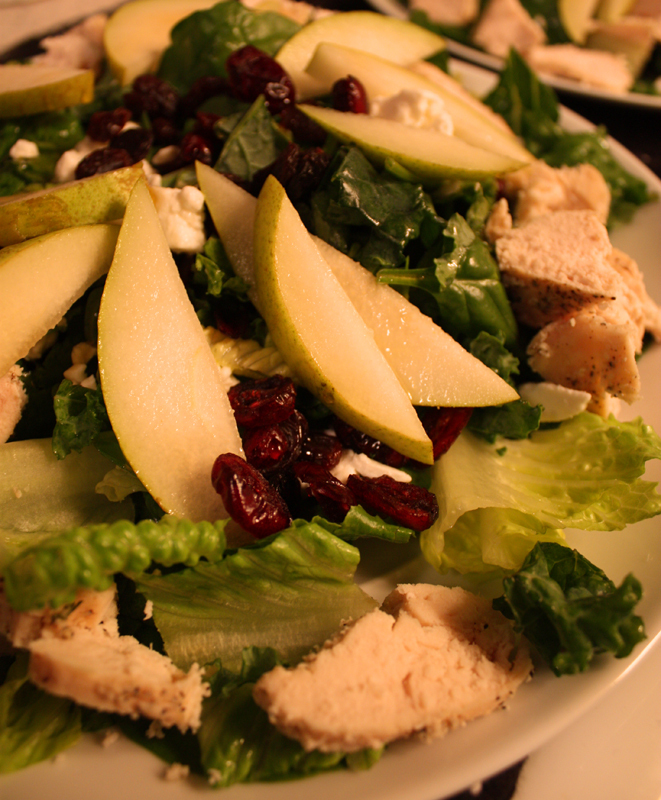 Slice chicken and pears into pieces and lay on top of your salad. Next, sprinkle a fair amount of feta, raisins and cranberries. Last, drizzle a little agave over the top. (*Note, I would have also put on some nuts, but was out) Enjoy!! Wow, sometimes it’s really hard to keep this updated. 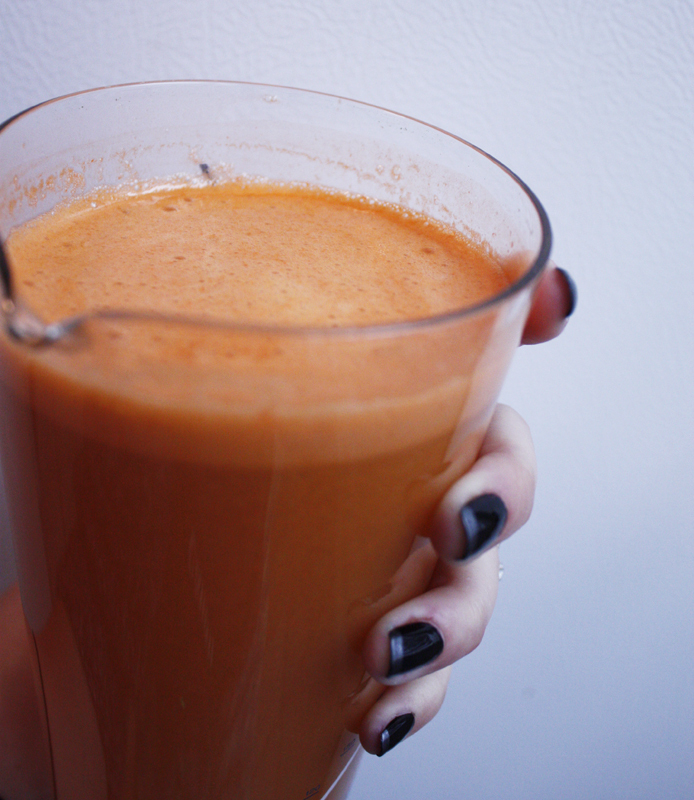 So, long story short, on day 3 of my juice fast my juicer decided to quit. Yes. Black and Decker continues to live up to their name. I still think it was a bargin though, a $30 dollar juicer while you decide if juicing will become a part of your life or not? I know many people who bought one, and more expensive ones that didn’t even last a week and won’t go back to juicing ever- so really why waste A LOT of money on a new temporary toy? So while I wait for a new one to come, or a refurbished one, or whatever, my juice fast lasted 3 days. Give in to new things, new beliefs and change! Ok, so later on when we became hungry later we treated ourselves to some melty cheese sandwiches and our favorite organic soups. 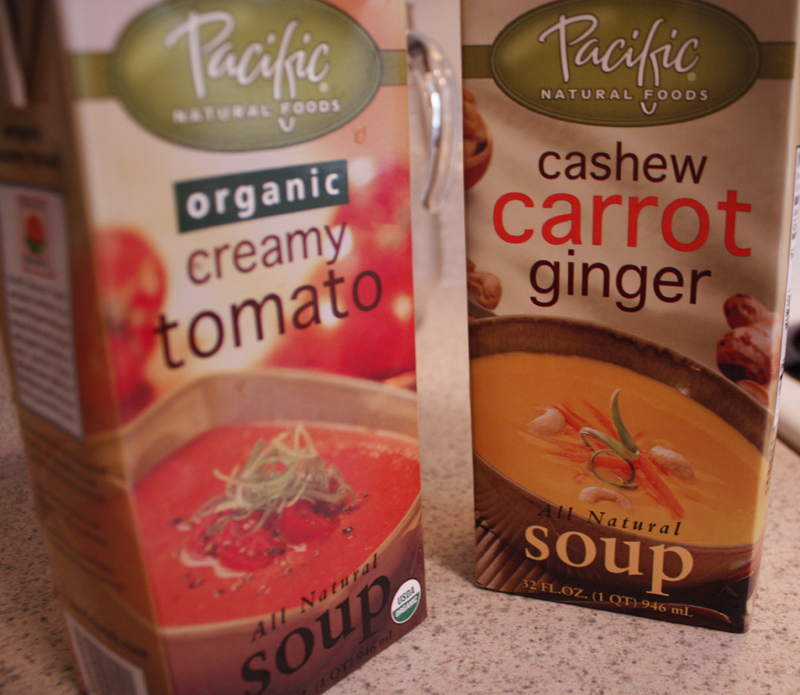 (I have posted them before, I’m absolutely addicted to the “Carrot, Ginger, Cashew” soup. 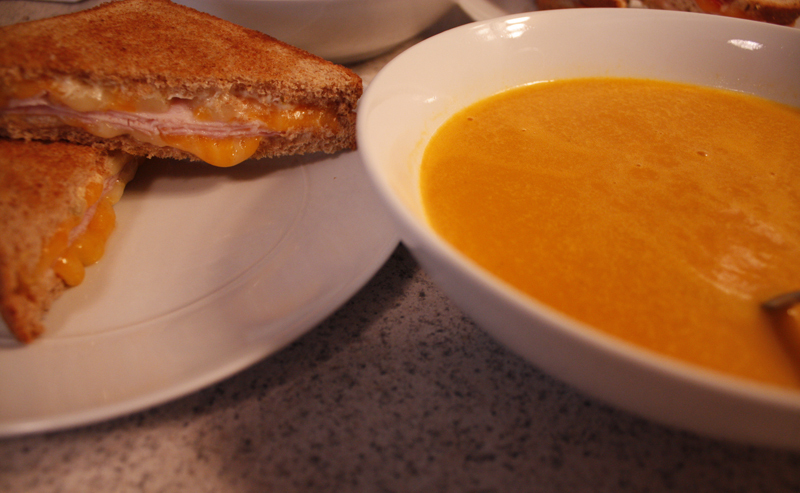 Mine consisted of my Carrot, Ginger, Cashew soup with toasted wheat bread, some slices of turkey and cheese. 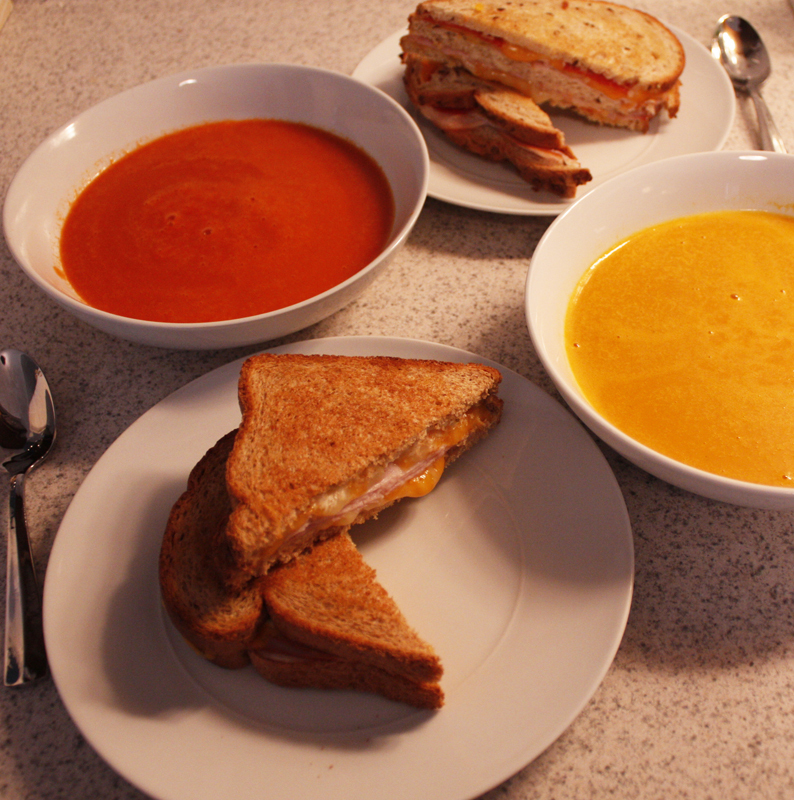 And, his consisted of Tomato soup with Rye bread, ham, turkey, some slices of turkey pepperoni and cheese.